This guide will walk you through the steps to take and things to do to get up and running quickly. We will include templates and tools and everything you will need to successfully launch the School Broadcast Program at your school. Keep your program running smoothly with the Best Practices Guide. At anytime if you need help or assistance with any of these activities, please reach out to us. We are here to help you. Just email us at accounts@playonsports.com or call our technical support line at 877.339.7529. Identify the key people who will help to run your broadcasts and their roles. Purchase equipment. Please see our list of recommendations. Make sure that the appropriate ports have been opened and the appropriate firewalls taken down on your school's network. There may be restrictions on downloading, uploading, and streaming at your school. Please refer to the Technical Requirements Guide here. Make sure that you have the PlayOn Producer software installed on your streaming laptop. Check out our calendar of training webinars. Schedule a one-on-one training session with one of the SBP Account Managers. For those of you that are more independent, watch our instructional videos or read the user guides. Now that you've been trained, you're ready to start producing and marketing. If you have not already, have PlayOn Producer installed on your PC laptop or follow our guide for doing this yourself. Through our instructional videos on the NFHS Network support site. At one of our webinars. Click here for a calendar. Schedule a one-on-one remote training schedule with an Account Manager. You can email them ataccounts@playonsports.com. Schedule a test event and run a trial broadcast. The instructions for properly scheduling a test event are in the attachments below. Practice your broadcasting process. Remember, you will want to set up at least an hour and half before the start of your event. Print out the PlayOn Quick Start Guide below to help you. You will increase viewership if your audience are aware of what events are coming up and know when to check back in with your site. You can plan which members of your broadcasting team will be covering certain events. You will have information to include in your marketing messaging. Gather the team logos for of the opponents you will be playing. You can download a zip file of our Team Logo Library (found in Resources and Documents) page below or learn how to create your own here. Need an idea on how to produce a certain kind of sport? Check out our event-specific "Production Guides" on the Resources and Documents page. Within the first month of being a member of the School Broadcast Program, you should be trying to produce at least one broadcast a week and building your marketing strategy. Continue to broadcast, and consider producing a diverse array of events. Review your first set of productions and see what you can do to improve your broadcasts. Experiment with different event types. Quantity and diversity of events is the key to expanding your audience. Check out the SBP Production Guides. 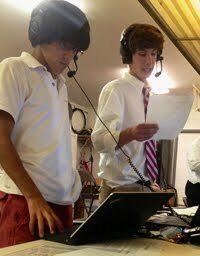 Grow your broadcasting team by having them train additional students.